One of the most interesting books this summer may be a rather innocuous book by Anne Wolf, a leading Tunisia and North Africa specialist. In Political Islam in Tunisia: A History of Ennahda, Wolf, a University of Oxford researcher, presents the hidden history of Ennahda, Tunisia’s main Islamist movement, from the 1960s until the post-revolution present. Before the popular uprisings of 2011 and the overthrow of then President Ben Ali, Ennahda was banned and barely researched. Based on more than four years of field research, and over 400 interviews, as well as access to private archives, Wolf’s account reveals in unprecedented detail one of Tunisia’s most influential political actors. Wolf tracks the evolution of Ennahda’s ideological and strategic orientations within the local turbulence of Tunisia’s political contexts. As the first full history of Ennahda, the book ought to be rightfully lauded as a major contribution to literature on Tunisia, Islamist movements in general, and more broadly political Islam in the Arab world. It is an essential read for anyone who wishes to understand why Tunisia, hitherto at least, remains the last revolution standing from the Arab Spring. What makes Wolf’s account especially interesting is the tantalising possibility of Ennahda offering a different answer to the question what should be the role of political Islam in the Arab public sphere. Ennahda’s somewhat surprising answer is a claim to a specific Tunisian experience. Despite the claim of a Tunisian exceptionalism, one cannot help but wonder if such a claim belies the possibility of a Muslim democracy that offers a different approach from the failure of the Egyptian Muslim Brotherhood, or Turkey’s AK Party, which had been hailed as the first post-Islamist party, but whose increasingly authoritarian turn have dismayed both inside and outside observers. Wolf is particularly good at distinguishing Ennahda from the Egyptian Muslim Brotherhood, which many analysts treat as the paradigmatic Islamist movement. So whilst she notes the peak of Muslim Brothers’ influence in the 70’s, she traces Ennahda’s intellectual heritage back to the reform-minded clerical classes of the recently reopened Islamic university of Zaytouna, who objected to the French colonial penetration in the late 19th century. What emerges is that Ennahda perceives itself as inheriting a dissenting strand of Islam that railed against the official scholarly establishment who were co-opted by the regime who subordinated French colonial interests over those of Tunisia. She notes the parallels between Ennahda and these reformist minded ulama not rejecting modernity, but insistent on providing a modern Islamic alternative. In her retelling, Wolf provides more support for a more ambivalent reading of early Arab modernists not as liberal reformers, who did not want to make Islam more ‘progressive’ as we would see it, but who wanted to articulate an Islam to make it more relevant for the lives of contemporary Muslims. Tracing Ennahda’s roots as the heirs of a reforming Zaytouna heritage is also important for demonstrating its bona fide Tunisian roots. This serves to undermine the efforts of successive regimes in questioning Ennahda’s Tunisian’s roots, tainting it with the brush of foreign subversion be that from Egypt, Saudi Arabia, or of more contemporary relevance Iran or Qatar, depending on the political context. That this demonstration is necessary, speaks not only to the effectiveness of Ben Ali’s propaganda as it does about the abiding power of French Laïcité tradition amidst the powerful and stridently secular elites in Tunisia. 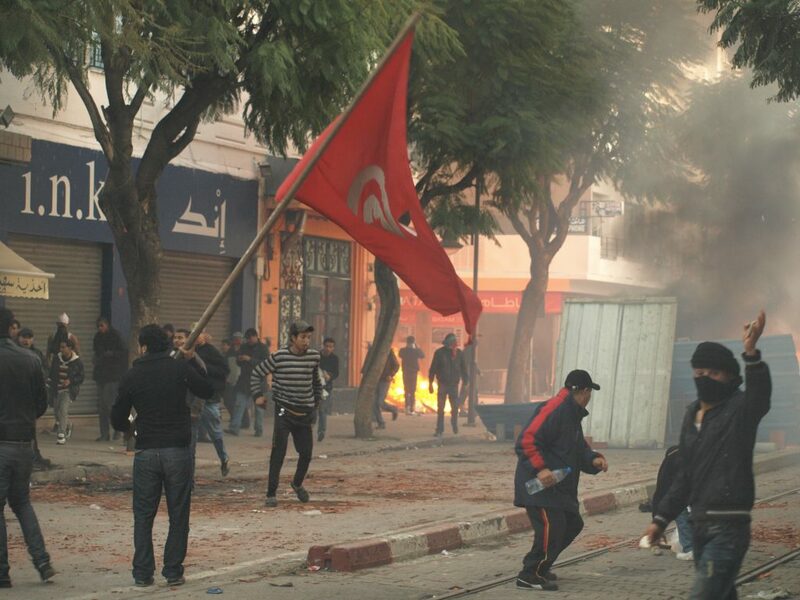 Wolf dismantles Tunisia’s long-standing image as a ‘fortress of secularism’. She notes that whilst the country’s first president Habib Bourghiba vehemently initiated various aggressively secular modernisation drives that included dismantling the traditional religious establishment in Zaytouna and Al-Qayrawan university, the jewels of Islamic scholarship in North Africa, which was later built upon by his successor Ben Ali, this was not embraced by the majority of the public. So whilst the state marginalised political expressions of Islam and successfully profited in utilising an international image of a secular Arab state par excellence, the porosity of such a facade was laid strikingly bare, with Ennahda winning a landslide victory gaining 37 per cent more than the next eight leading parties with only 35%, despite having no grassroots organisation one year before the revolution. And whilst it lost support in the 2014 elections, by becoming the second major party, Ennahda has confirmed that they were here to stay as a major player and will continue to shape Tunisia’s future. The years of repression that Ennahda suffered during their underground years both under Bourghiba and especially Ben Ali is covered extensively and sympathetically. Ranging from physical deprivation and social isolation to torture whilst in prison, to the harassment and abuse of families of those sent to prison. Despite her measured prose the author doesn’t hesitate to make sharp commentary. For instance, she claims that Ennahda activists have ‘internalised narrative of victimhood’ whilst failing to acknowledge any violence that they may have committed or threatened to commit themselves. While it is easy to dismiss Wolf’s sentiments as somewhat glib, she correctly distinguishes the torture and harassment suffered by Ennahda and the latter’s embrace of victimhood. Even if we may be reluctant to begrudge victims of torture for any resentment towards members of the former regime, it pays to remember however that these activists are negotiating with members of the former regime. It is an awkward pre-condition for Tunisia’s successful post-revolutionary politics, that it must be inclusive and forward looking enough to give elements of the previous regime a stake in the new post-revolutionary status quo, save for the most egregious. Yet reading some of Wolf’s harrowing accounts it must surely feel like the tortured are in negotiations with their torturers. That such sentiments are easier said than done only puts in perspective how difficult the construction of a democratic Tunisia will actually be. In a field that too often discusses Islamists without allowing them to express themselves, her account relies on hundreds of interviews, and the book successfully reveals the voices of those she writes about. Her account leaves the reader not only wanting more, but also wondering what she has left out. One striking example of the latter is the extent to which her interviewees have insisted on their anonymity. Whilst a hardened Tunisia watcher may amuse themselves trying to guess who or what Ennahda faction the interviewee comes from; a less seasoned observer may wonder how impermanent the political status quo must feel if six years after the revolution so many have chosen to remain anonymous. It is suggestive that activists are wearily hedging their bets, fearful of a possible counter-revolution and any ensuing bloody crackdown. It’s a salutary reminder of how novel the democratic experiment remains in Tunisia, and that it has yet to establish any political norms beyond a narrow elite. Compare how different such a situation is to Turkey where despite the occurrence of regular military coups acting as correction, the idea is that after a brief interregnum the acknowledged norm is to return to a democratic albeit staunchly secular ideal. Only now after a long history of coups has the idea of coups become gradually unthinkable for the public. It was notable that in 2016 even staunchly secular parties, those who would’ve most benefited from any secular correction, immediately condemned any kind of coup attempt. The same cannot clearly be said of Tunisia and it puts in perspective why the Ennahda leadership has prioritised economic reconciliation instead of cracking down on crony capitalism so stymieing the economy. Wolf notes that this would envision a freezing of corruption investigations with the promise in return of a capital injection into the economy. The rationale here is clearly not economic but political, in other words, a kind of insurance policy where the idea is that members of the former regime’s business and political elite would be less willing to destabilise a political status quo when it has so much of their capital invested in it. What is striking is that both parties know how much these business and bureaucratic elements are essential to Tunisia’s success, not only because of their capital but because they have monopolised the country’s know-how and business experience. Ennahda’s leadership finds itself in an unenviable position, they have to hold their nose to any repugnance they may feel to any perceived ‘dirtiness’, as they know that the threat of their departure would significantly diminish Tunisia’s post-revolution and may return it to the same economic conditions that incited the revolution in the first place. Furthermore, they know they are not the only ones courting them, and that significant external backers are prowling and would like nothing more than Tunisia’s democratic experiment to fail, something that has become especially prominent in light of the ongoing Qatar crisis in the Gulf. In this respect, the book’s one significant omission is the minimal coverage given to Ennahda’s thoughts on foreign policy. In this respect even if Wolf’s approach is ethnographic and her focus lies in examining Ennahda’s history given the precarious environment that Tunisia find itself in, with a civil war next door in Libya, and neighbouring an authoritarian military regime in Algeria with a troubled history with Islamism, one would be surprised if Ennahda’s leadership’s calculus had not been informed by Tunisia’s external actors. Consider for example France, Tunisia’s former colonial power, whose only role in the book is that of a site of exile for Ennahda activists, as is Switzerland and the UK, the latter of which Ghannouchi himself escaped to. Even more surprising is minimal mention of Algeria which has been accused of decidedly murky actions in the Algerian Civil War during the 90s, and a regime that has never been hesitant to intervene in its neighbours’ conflicts if it served it’s perceived strategic interests. One imagines that it would be interested in the appearance of an Islamist dominated democracy next door. Yet save for the most curious bread crumbs; we learn that Algerian generals smuggled Ghannouchi out, and hints of an ongoing ‘special relationship’ between them, except for this there is very little in Wolf’s narrative to suggest that Ennahda has been conscious of the five-hundred-pound gorilla next door. Pondering on how all this relates to Ennahda’s domestic politics, a strong impression forms as to how much the absence of a talented secular opposition hobbles Ennahda. In the absence of an internal check to Ennahda, its base has quickly latched on to conspiracy theories explaining away the frustrations of Ennahda’s goals. The worst problem is not that they are disempowering, but that there may be more truth in them than there are lies. With certain Gulf nations having made good on their reputation as regional check to Islamists across the region, fears of a regional bogeyman have unexpectedly proven to be more effective than the presence of a 500 pound somewhat belligerent gorilla next door. One wonders if in the absence of a robust opposition Ennahda can discipline itself and exercise restraint over its ambition and sense of entitlement and mind Tunisia’s strategic environment which has previously kept a natural check on everyone’s ambitions. If Wolf is revealing Ennahda’s past, she is more elliptical of its future. She wisely counsels us to be wary of complacency and is dubious on whether Tunisia’s revolution can yet be labelled as a success. Whilst the survival of the sole remaining revolution should be celebrated she warns her audience away from wishful thinking; we should not confuse Tunisia’s designation of ‘least unstable’ political society post-Arab Spring with it being deserving as a governance model for other Arab countries to follow. Indeed, the very threat of such a label has encouraged elements both internal and external, to resolve to destabilise Tunisian politics further. She also points out that Ennahda itself is ill equipped to tackle future problems before coming to power it has built up little to no experience in governance at either local or national politics, unlike say the Turkish AK Party. Instead it’s leadership was borne out of an ideological struggle which has left them unprepared for issues of policy and national leadership: as some prominent party members themselves have told analysts, ‘[w]e went from the prison to the palace’. As for the hope that Ennahda can become a progressive Islamist political actor, after hundreds of interviews with Ennahda activists Wolf is dubious how far-reaching the extent their progressive commitment actually is. Noting that Ennahda’s a big tent party, her narrative notes the differences amongst its leading cadres, and she pointedly circumscribes the role and ideological authority of Ghannouchi that belies much other literature. While his voice is obviously important, Ghannouchi is very much one voice amongst many. Furthermore, she adjudges that his apparent embrace of democracy and multi-party governance is as much motivated by strategic imperatives as it is borne from ideological convictions. More to the point, while the views of Ennahda’s leadership can be called at best ‘liberal’ and at worst ‘pragmatic’, she remarks that only when its base embraces this progressive commitment can Ennahda truly be considered reformed. She further notes the ill-guarded hostility and suspicion of the opposition towards Ennahda only serves to confirm its defensiveness and victimhood, not an attitude that is conducive to a successful transition to the inclusive democratic culture Tunisia needs. The fact that not everyone shares our convictions that liberal democracy is the best solution should not surprise us. Perhaps we should not be surprised that other cultures take a more detached and more pragmatic view towards liberal reforms, than Western nations whose very self-conception involves a triumphant repudiation of the dark age of ignorance that preceded it. Perhaps given that Tunisia is a country steeped in a pre-modern tradition that enjoyed its golden years before the onset of industrialisation, colonialism and modernisation, as a society it may be more reluctant and resistant to the modern democratic and liberal revolution. In that sense, we may need to wait it out until an internally organic political theology emerges that justifies a democratic Muslim governance model in alignment to its own internal tradition. However, such a modern manifestation will by necessity be contentious especially considering that there is no hierarchical centralised authority that can change a tradition by fiat from the top. If so, perhaps we need to adjust our expectations about what should be considered ‘good outcomes’ for political reform and the region. This would not be an instance of lowering the bar for the Middle East, but more realistically accepting that democratic forms of governance must suit the context of it’s local people. Lest we forget such sentiments echoes the argument made by early Zaytouna reformist Islamic thinkers that Ennahda claim descent from. It’s with these more measured expectations in mind that an excellent Hudson Institute policy paper by Eric B Brown and Samuel Tadros, advocates a form of Muslim republicanism. They argue that it is an American strategic goal for ‘Tunisia [to] emerge as a self-sustaining democracy that can contribute to solving the larger crisis of governance and republicanism in the Arabic-speaking world’. In this instance, what is proffered is not the hope of a liberal democracy but a more realistic idea, if rather vague, of a non-authoritarian Muslim democracy as an alternative to the ‘political cul-de-sacs of Islamism and unreconstructed laicism’. This would encourage a more inclusive Tunisian democracy to emerge whose excessive secularism does not alienate the broader populace from integrating and participating into new Tunisian democratic republic. Even more optimistically, the report hopes that a successful Tunisia could open up the possibility of gradual political reform in the region rather than encourage a ‘crash-bang-wallop’ revolution with all the dangers the latter entails. With the possibility of a vibrant Tunisian political society not only being desirable but also attainable, its authors hope that it could sparks a discussion in the Middle East about the kinds of governing models are attainable, as well as the Muslim world more generally. Furthermore, the authors recognise that within Ennahda there are competing wings and they stress the importance of bolstering the more pragmatic wing that will allow it to compete more effectively with other Salafi or Islamist tendencies. To the extent that this wing is successfully able ‘to persuade its rank and leadership that Islamism is over and that democratic Tunisia is already an Islamic state; indeed, that Islam requires civil democracy and pluralism’, then to that extent Ennahda becomes a more viable partner for the possibility of creating a long term stable MENA order. However, the report is well aware that more time is needed for this wing to become preeminent, and the running concern throughout the paper is whether there is enough time given the fragility of the revolution. Anne Wolf’s sympathetic yet realistic account of political Islam in Tunisia, makes it easy to understand why so many have placed their hopes on Ennahda to become a prized partner in the construction of republican Muslim democracy. Yet in a tragic irony, these self-same grounds of hopes explain why a post-revolution Tunisia remains fragile, why so many actors are invested in Tunisia’s continuing political dysfunction, and the ultimate aim being the destruction and final cessation of Tunisia’s fledgling democracy. It would seem that six years after the Arab Spring, the prospect of the Tunisian exception remains precarious and that everything is still up for grabs. A previous version of this article was published at OpenDemocracy on the 7th of September 2017. Faheem A. Hussain is a PhD candidate in Politics at Royal Holloway University of London studying the intersections of liberalism and multiculturalism. He has a BA (Hons.) in Arabic and Islamic studies from the School of Oriental and African Studies, London, a PGCE in Religious Studies from Roehampton University, and a MA in philosophy from Heythrop College, University of London. Find his writings at Some Thoughts, and occasionally at @FaheemHus. The views expressed in this article belong to the author and do not necessarily reflect the editorial policy of MENA etc. Previous Previous post: Mahdi al-Harati: A Libyan Garibaldi? Next Next post: Into the Heart of Darkness: Working Notes on Three ISIS Jihadists.